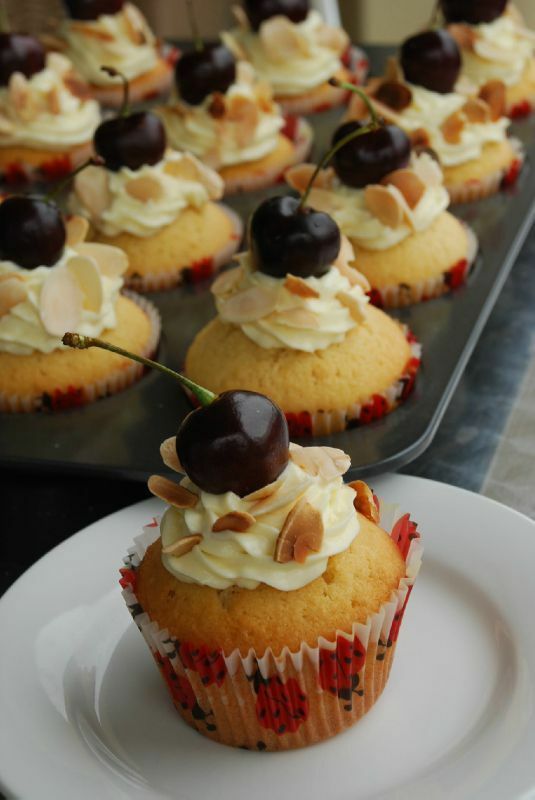 Those cupcakes are more almonds cupcakes with a cherry on top than a cherry & almond cupcake as the only cherry taste comes from the cherries I used on top of them to decorate. If you want your cupcakes to have a much flavorful taste of cherries maybe you should add some cherry jam in the center or add some fresh cherries to your dough prior to baking. 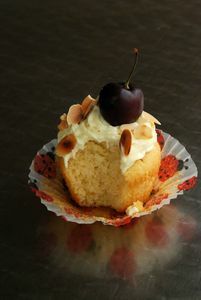 Despite the use of almond meal that usually makes cakes quite "heavy", those cupcakes are really light and soft. I like my frosting to be light (almost like a whipped cream texture) and not so sweet. So if you prefer a more "classic" frosting feel free to add a little bit more sugar and maybe less milk so the frosting gets "harder". Preheat oven to 200°C. Line twelve 80ml (1/3-cup) capacity muffin pans with paper cases. Beat the butter and the sugar together in a medium bowl until pale and creamy. Add the eggs, one at a time, beating well after each addition. Add the vanilla and beat until combined. Pour in the almond meal, flour and milk until just combined. Spoon mixture evenly among prepared pans. Bake in preheated oven for 20 minutes or until a skewer inserted into the centres comes out clean. Remove from oven. Transfer to a wire rack to cool completely. Mix the frosting ingredients together. 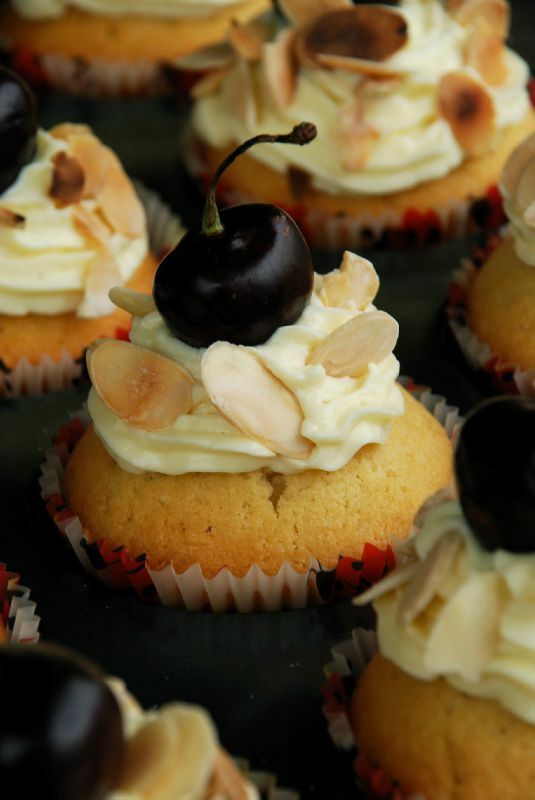 Pour the mixing into a pastry bag and decorate the cupcakes. Place them in a fridge. Grill the almonds on a pan until golden brown. Let it cool. 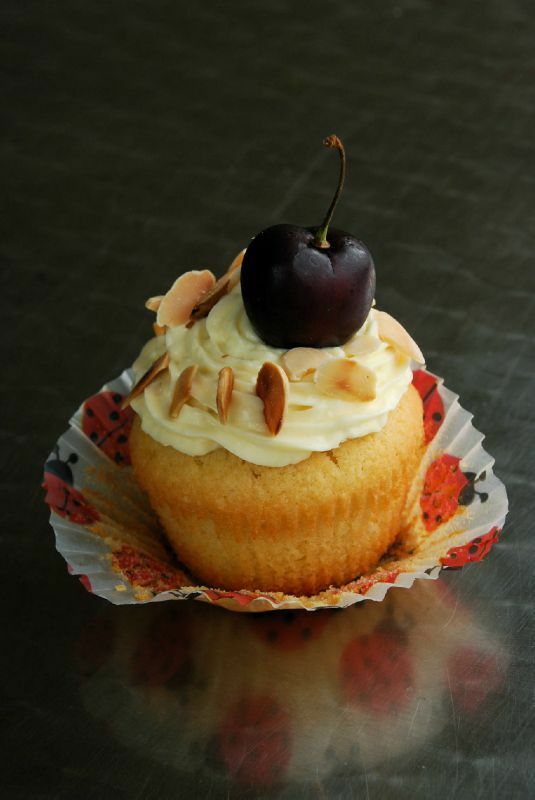 When the almonds are completely cool, sprinkle them on top of the cupcakes & add a cherry in the middle.